Muḥammad ibn Mūsā al-Khwārizmī (780c-850c) was a Muslim mathematician and astronomer, who made significant contributions within the mathematical field, through his algebraic understanding he managed to revolutionize the way the world processed equations. He was born in a Persian family, but due to the proliferation of the Arabic language, all his work was in Arabic. It would be unfair to limit Khwarizmi’s interest to mathematics itself, he also learned about Algebra, Geometry, Astronomy and Geography especially since he worked at the House of Wisdom. It was an institution in Baghdad (Iraq) where educated men gathered and translated scientific work, it must be kept in mind that this was a period when the Arabic language was on verge of flourishing. Hence Khwarizmi’s most well-known work was termed as “Hisab al-jabr w’al-muqabala” which helped create the word ‘Algebra’, therefore the Arabic language justifies the derivation of this sect of mathematics. 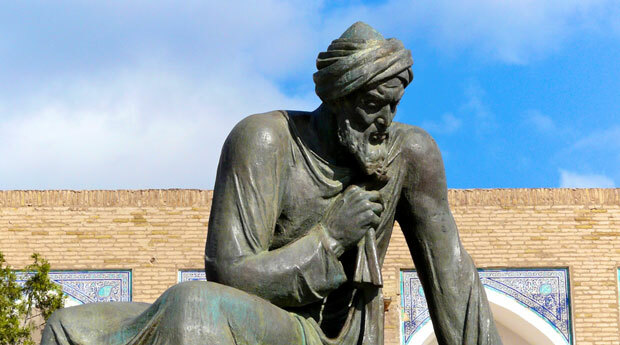 During the time of Renaissance, Europe classified Khwarizmi as being the “original inventor of algebra”, he wrote his famous book which was called “Compendious Book on Calculation by Completion and Balancing”. This was the first book to describe systematic solution and quadratic equations, he also wrote pieces on mechanical devices such as the clock, astrolabe and sundial. Khwarizmi can also be accredited for familiarizing the Western World with the decimal positional number system; moreover he was the man accountable for the use of Arabic numerals in Mathematics. Till today, people marvel at how he brought about the concept of Algorithm in Mathematics, this explains how the word “algorithm” is a Latin, English distortion of his name. It must be understood that even though he was a brilliant mind that wrote his own books, and discovered Mathematics in a way no one had before; he reviewed existing knowledge in the various fields that interested him. Some of knowledge could be traced back to Greek, Indian and various other sources. Khwarizmi made some alterations in Geography too, he rectified ‘Ptolemy’s research’, he also wrote a book called “The Image of the Earth” which focused on Ptolemy’s Geography however consisted of values that were improved (included the Mediterranean Sea, Asia and Africa). He monitored the work of about 70 geographers to formulate a map of the world that was “known” at that that time. Since he was also an astronomer, he came up with the tables of Sind and Hind which encompassed the tables of trigonometric functions of sines and cosines. This great man’s work includes writings based upon the Hebrew Calendar, he also wrote a treatise on it. To prove his astronomical abilities, many scientists are aware of his book which was titled as “Extraction of the Jewish Era”. In conclusion Khwarizmi’s talents were holistic since they ranged from one subject to another; this well-educated man didn’t hesitate in writing his own findings and exploring new dimensions in fields that intrigued him. He clearly left his mark in Mathematics, Astronomy and Geography; his achievements within that particular time period have continued their legacy till present times.